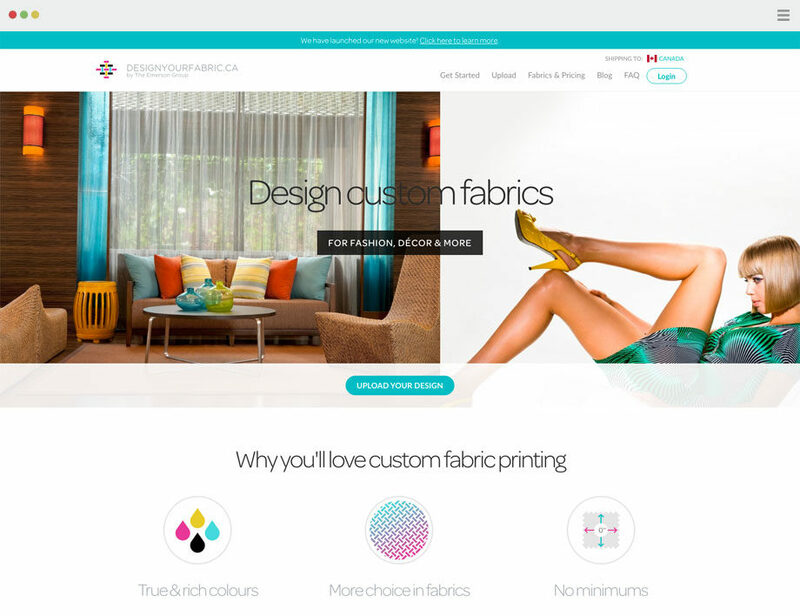 We’ve recently launched the new Design Your Fabric website and we couldn’t have been more excited. Design Your Fabric is a custom fabric printing company that allows you to digitally print your own fabric and have it shipped to your home. Design Your Fabric approached us wanting to make some much needed changes to their existing process which was using a mixture of WordPress and spreadsheets to handle their e-commerce and operations. The website was constantly slowed down due to their large volume of orders and the highly customized WordPress system wasn’t able to keep up. We use the latest web technology available to improve usability, user experience, and performance. After analyzing the situation we decided to move away from WordPress and rebuild their system from scratch. By separating their e-commerce and operations into specialized components we would be able to streamline their process and create a system that could scale to a much higher volume of orders. It also gave us the opportunity to use the latest technology available to improve usability, user experience and performance. Now taking and managing orders is easier than ever. Get in touch with us and let’s talk how we can help your business by developing technology solutions and programming custom web apps for your needs.